This artist's illustration shows the evolution of the universe over time, starting with the Big Bang (left). Was the universe created with a Big Bang 13.7 billion years ago, or has it been expanding and contracting for eternity? A new paper, inspired by alternative explanations of the physics of black holes, explores the latter possibility, and rejects a core tenet of the Big Bang hypothesis. 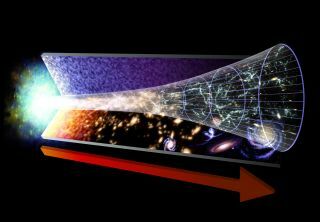 The universal origin story known as the Big Bang postulates that, 13.7 billion years ago, our universe emerged from a singularity — a point of infinite density and gravity — and that before this event, space and time did not exist (which means the Big Bang took place at no place and no time). Another key piece of evidence is the cosmic microwave background (CMB), which is thought to be heat left over from this great cosmological event. It can be observed in every direction and has no single origin point. Scientists think the CMB began propagating through the universe about 380,000 years after the Big Bang, when atoms began to form and the universe became transparent, according to the European Space Agency. However, there is no direct evidence of the original singularity. (Collecting information from that first moment of expansion is impossible with current methods.) In the new paper, Brazilian physicist Juliano Cesar Silva Neves argues that the original singularity may never have existed. This map of the sky shows light from the cosmic microwave background (CMB), or light left over from the initial expansion of the universe. The colors indicate temperature variations in the CMB. "The Big Bang as the initial singularity is only a speculation," Silva Neves told Space.com. He said that "there are many observations in cosmology" that support the hypothesis that the universe went through a period of rapid expansion, but that there is no direct evidence that this expansion started with a singularity. In a paper published Aug. 29 in the journal General Relativity and Gravitation, Silva Neves, a researcher at the Mathematics, Statistics & Scientific Computation Institute (IMECC-UNICAMP) of the University of Campinas, in Brazil, proposes an alternative cosmological model that does away with the necessity of this original singularity. His model includes a concept known as bouncing cosmology. Silva Neves combines this concept with alternative theories of the physics of black holes. Similar to the original singularity from which the universe emerged, black holes are believed to have a point of infinite density in their center. But while a point of "infinite" mass can exist easily on paper, scientists have always struggled with how such a thing could exist in reality. And general relativity suggests that the normal laws of physics break down inside a singularity, and thus it offers little guidance to resolve this conundrum. In a 1968 paper, physicist James Bardeen proposed a concept of the so-called regular black hole — that is a black hole without a singularity in the middle. Such a black hole is mathematically possible if its mass is not constant, but rather depends on the distance to its center. Silva Neves said his "cosmological model was built from studies in regular black holes," and avoids the need for a singularity in both black holes and the beginning of universal expansion. He notes, however, that this is still purely hypothetical. "There is no empirical evidence for bouncing cosmologies today," he said. "But there is no evidence for the initial singularity as well." Silva Neves said that if indeed the universe is infinite, it might be possible to find what he calls "vestiges of the previous phases" — remnants and leftovers of the previous cosmic contraction and expansion period. According to astrophysicist Gonzalo Olmo from the University of Valencia, in Spain, Silva Neves’ model is mathematically feasible; however, it might not be supported by some accepted scientific observations. "To mathematically implement this black hole trick in a cosmological model implies going from a homogeneous universe where all spatial points have identical properties to inhomogeneous models," Olmo told Space.com. "Observations of the cosmic microwave background indicate a high degree of homogeneity in the early universe and it is unclear how this inhomogeneous model could yield a homogeneous universe like the one we observe." That, however, doesn't mean that another bouncing cosmology model could not get it right in the future, Olmo said.